Electrolytic non-polarized (bi-polar) capacitors are a perfect low-cost solution for use in passive speaker crossovers. They feature axial leads, a tolerance of 10%, and are rated at a 100 VDC working voltage. 39uF Electrolytic Non-Polarized Crossover Capacitor 100 Vdc Tolerance: 10%Dimensions: 13 mm Dia. x ..
47uF Electrolytic Non-Polarized Crossover Capacitor 100 Vdc Tolerance: 10%Dimensions: 13 mm Dia. x ..
56uF Electrolytic Non-Polarized Crossover Capacitor 100 Vdc Tolerance: 10%Dimensions: 13 mm Dia. x ..
68uF Electrolytic Non-Polarized Crossover Capacitor 100 Vdc Tolerance: 10%Dimensions: 13 mm Dia. x ..
82uF Electrolytic Non-Polarized Crossover Capacitor 100 Vdc Tolerance: 10%Dimensions: 16 mm Dia. x ..
100uF Electrolytic Non-Polarized Crossover Capacitor 100 Vdc Tolerance: 10%Dimensions: 16 mm Dia. x..
120uF Electrolytic Non-Polarized Crossover Capacitor 100 Vdc Tolerance: 10%Dimensions: 16 mm Dia. x..
150uF Electrolytic Non-Polarized Crossover Capacitor 100 Vdc Tolerance: 10%Dimensions: 16 mm Dia. x..
220uF Electrolytic Non-Polarized Crossover Capacitor 100 Vdc Tolerance: 10%Dimensions: 18 mm Dia. 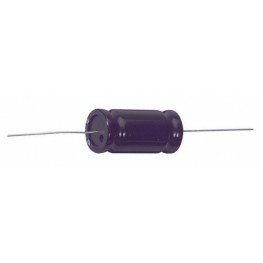 x..
270uF Electrolytic Non-Polarized Crossover Capacitor 100 Vdc Tolerance: 10%Dimensions: 22 mm Dia. x..
300uF Electrolytic Non-Polarized Crossover Capacitor 100 Vdc Tolerance: 10%Dimensions: 22 mm Dia. x..
330uF Electrolytic Non-Polarized Crossover Capacitor 100 Vdc Tolerance: 10%Dimensions: 18 mm Dia. x..